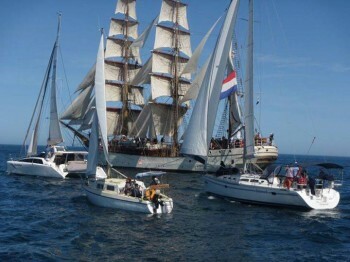 The day began with warm glorious sunshine, wind and the promise of an amazing event...three Dutch tall ships...awesome! I always prefer to be out on the water and on a day like this day presented with favourable sailing conditions, ahh, magic! One our One &All we headed out down the river motoring. I am very adept at taking photos from a yacht under sail. Taking photos from a tall ship under motor I find to be quite an orientation. In particular, the motion of the vessel. It is soo different. Gauging the movement and momentum with which to line up one's shots took some focus. This on top of what one is already focusing on in relation to the shot itself. With digital, this is more imperative as it is more sensitive and unforgiving in relation to slightest of movements the moment the shutter is pressed. A slight fraction if a second delay...leading one to be always prr-empting the environmental happenings at the time. Being on board our One & All I knew we would be in a prime position to catch good opportunities of all three coming into port. I for one was not disappointed. Coming out of Outer Harbour, mmmm what a sight. As we cleared the Outer Harbour break water there was Tecla snug in her anchorage off Semaphore. . So silent and still, rocking to the gentle motion of the waves. No visible stirrings aboard. Someone yelled out 'ahoy'! But no response seemed to tell of the crew not having stirred yet. But then Tecla did drop anchor at about 3.00something am in the morning. So we ventured on towards Glenelg. We sailed past, soaking up the grand vision, taking photos in anticipation of sighting Europa and Oostershelde. Slowly in what seemed to take forever, two tiny specks appeared on the horizon they grew larger. And sure enough, the sails so distinctive of tall ships came visible. How fast were they going? It was almost akin to watching the kettle boil. While we were waiting I took many feature shots of our One & All under sail. I even helped out on a few lines. This was great. I found easy having been volunteer crew on other day sails. By now the flotilla of yachts and other vessels were growing in number as the welcoming committee. This included the Channel Nine helicopter. The photographer in the chopper put a lot of faith in his harness as he was hanging out to catch his shots. We got buzzed a fair bit being on-board our state's One &All Sail Training Vessel. It took a while before the Europa and Oostershelde came into view. But oh, what a sight. And they got larger and gathered speed as we turned and headed back to port to lead them in. It was soo fantastic to see so many yachts and other vessels alongside them following them. The excitement began to build as more got closer to gain a look and photos. When we turned and headed back towards Outer Harbour so as to lead them in., for me it was like, hang about, are we ever going to get up closer to take photos? Soo majestic...ocean going tall ships mostly using the power of the wind to bring them here...how awesome! It was so amazing that they were now entering our river to dock at our port alongside our two tall ships. I made sure that I got as many photos as I could with our Dutch visitors going past as many identifiable landmarks along our Port River. A way to metaphorically ' pintch' myself that they really were here! Wow! Entering thru the bridge...so incredibly awesome...the Europa with her elegance of her white hull and sails. The Oostershelde, her striking slender elegance. And Tecla...with her traditional homeliness. What a neighbourhood! I took as many photos as I could of this before I disembarked. They were moored with Europa first, followed by our One & All, Oostershelde, Tecla, our Falie, and our historic steam tug Yalta. And as if on cue, a glorious sunset blessed what was an incredibly fantastic day with the promise of what the ensuing community gatherings, functions, day sails, functions, open day�in short the fun, excitement and fellowship to come. Please enter the captcha text below, then press submit.